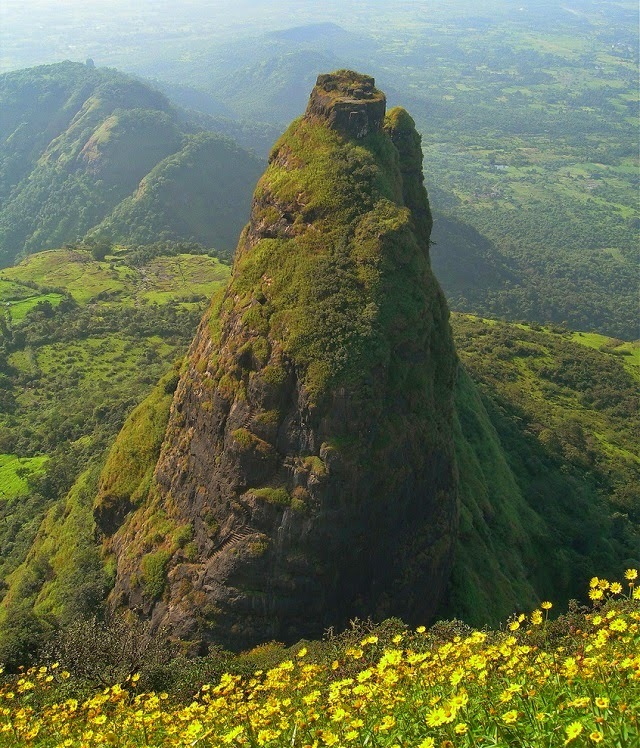 Kalavantin Durg (also known as Kelve Teen or Kalavantinicha Sulka) is located on the northern edge of the Prabal plateau between Matheran and Panvel in the Indian state of Maharashtra, at an elevation of 2,300 feet in the Western Ghats. It is also visible from the Mumbai-Pune Express Highway. According to legend, Kalavantin Durg is believed to have been built for a queen named Kalavantin during the time of Buddha or around or before 500 BCE. The fort is accessible through steps that were cut into the rock of the hill and looks quite impressive feat. Kalavantin Durg is also called the Climb to Heaven. No rail on the edge and no ropes on the wall, God forbid if you have vertigo. Worst of all, the hardest part is coming down. Kalavantin worthy Durg fort is considered the most dangerous in the world. Since Kalavantin Durg is at such a height you can see the Peb, Chanderi, Matheran, Karnala, and Ershal forts and The City of Mumbai also visible. On every Shimga Festival of Holi locals from Machi-Prabal Village dance on top of the fort and they consider it a part of their culture and heritage so a good time to visit this fort would be the Holi Season.